We are considering changing the name of the cottage to Apple Walnut Cottage. No? Sort of sounds like a diet dessert, doesn’t it? 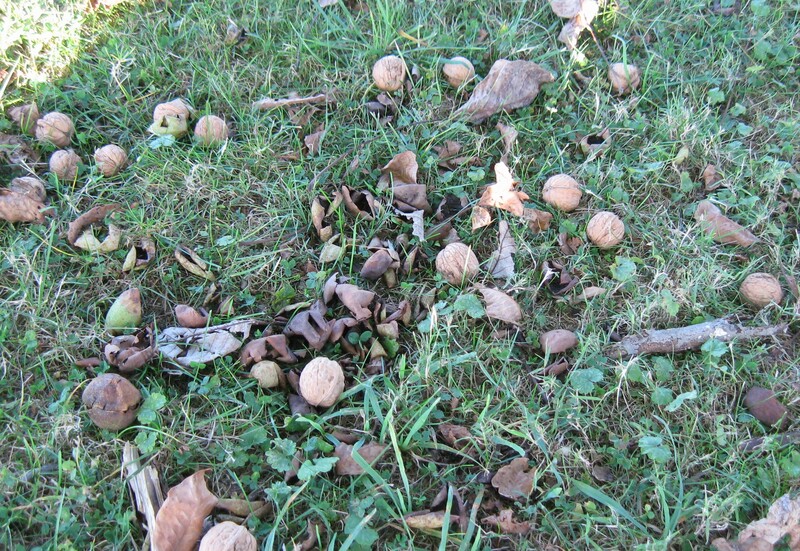 The nut harvest has been bountiful. In fact, the entire garage bedroom is filled with drying walnuts. Last week we thought we had an amazing amount, and this past weekend the nuts on the ground doubled. We had to go scrounging for more screens — sliding glass door screens do have a use after all! 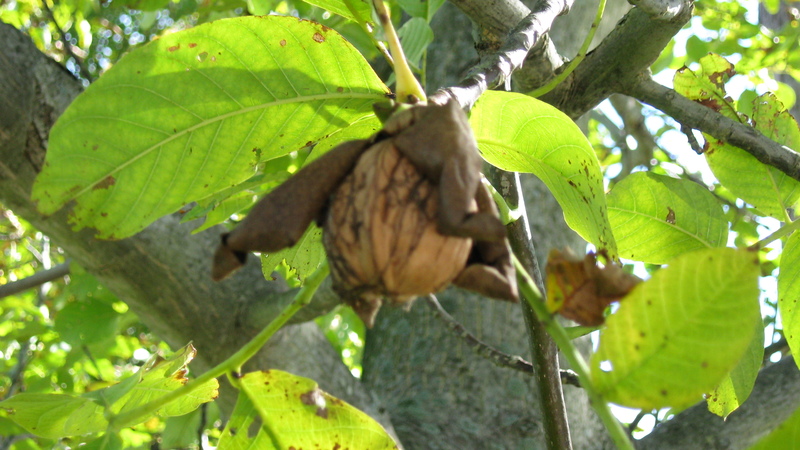 The amazing fact about these English Walnuts is the husks dry in the trees and the walnuts fall from the husks ready to pick up. 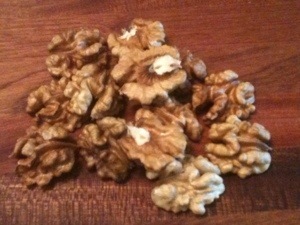 English walnuts will keep in the shell for several months. Shelled nuts can be kept in the refrigerator for up to 6 months and in the freezer for well over a year. 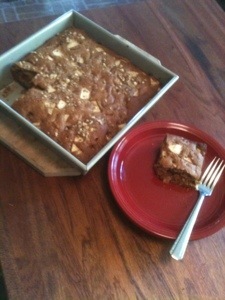 With all these apples and walnuts, a cake is calling out to me… I was about to make one of Mr. H.C.’s favorites. The recipe was given to his mother by Anna Hincy, one of the cafeteria ladies at East Franklin School, who also did cakes on the side. But after looking at the recipe, I think I’ll pass. I was willing to make it from unbleached white flour; I was willing to use sugar; but I draw the line at Crisco… So I will experiment with this recipe and give you the results later. (It sounds like it might be a Christmas Cake.) In the meantime, here is a snack cake you can eat with no guilt. 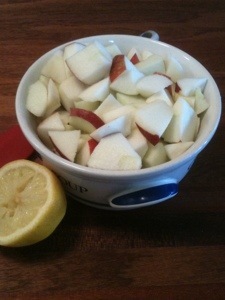 Lemon juice to pour over the apples to keep them from browning. Pour the honey into a medium-sized mixing bowl and beat with an electric mixer for ten minutes. I had never done this before, but don’t eliminate this step. It makes the honey thick, light, and creamy. I peeled most of the apples, but I left one pretty red one unpeeled for color. 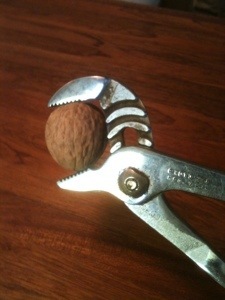 Just in case you are cracking your own walnuts, this is the tool to use. These Channelocks are fully open and they give the nut-cracker lots of control. Add the coconut oil and beat until well mixed. Then add the two eggs and the vanilla and mix well. Sift together the flour, baking soda, salt, and spices. Add the flour mixture to the honey mixture in two batches and just mix it in by hand with a large spoon. 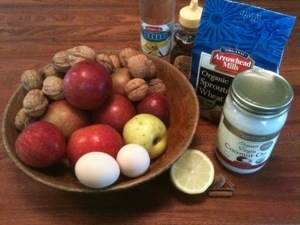 Mix in the nuts and apples by hand also. Spread into a well-greased 9 x 9 pan and bake at 350 degrees for 25-30 minutes. Cool for 30 minutes before serving. Coconut oil is the new miracle food. It’s pricey, but I just bought some at Trader Joes for $5.99 a jar. It may be overhyped — it is one of those good fats — but you can read about its health benefits at this website. Sprouted wheat flour is not gluten-free, but the wheat is sprouted and then the sprouts are ground into this flour-like substance, which does give it much less gluten and makes it more easily digested. You can get it at health food stores, co-ops, and online at Shiloh Farms. (Note: Sprouted wheat flour is not completely gluten-free.) Of course, you can use regular flour — just increase the amount to two cups. I could hardly wait to taste this cake so I cut a piece before it was cool. This is one cake that needs to cool a bit — it tasted much better a half hour later. I adapted this recipe from The Moosewood Cookbook by Mollie Katzen. 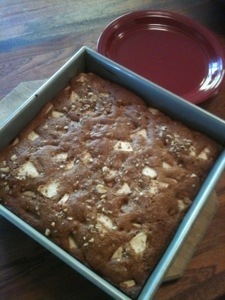 But I changed it enough that I’m giving it a new name — Apple Walnut Cottage Cake. Yep, a healthy diet dessert. (Mr. H.C. thought this cake was delicious; but, truth be told, he is dessert-starved these days, and he would probably eat cardboard if it had honey or maple syrup on it.) Not that this cake tastes like cardboard! It is actually better the next day for breakfast. Enjoy! I love all the pictures and will try the Chanel lock. I do not have the energy to bake a cake so will enjoy yours vicariously. I have been putting the nuts in my hot cereal in the morning. Will go read about the coconut oil now. I like Apple Walnut Cottage!